If you’re traveling by vehicle, consider taking State Route (SR) 179 which is designated as an All American Road by the Federal Highway Administration (FHWA), based on its natural, recreational and scenic qualities. The National Scenic Byways Program recognizes, preserves and enhances selected roads throughout the United States. Or, consider taking a flight to Sedona and land at one of the most picturesque airports in the country! Of course, if you arrive from the north you’ll travel on SR-89A, a beautiful twisting drive designated as the Sedona-Oak Creek Canyon Scenic Road. Use Sedona as a base camp for your trip to the Grand Canyon. Sedona sits just over 100 miles south of the Grand Canyon and it’s a beautiful drive. Slow down and yield to traffic from the left. Wait for a gap in the traffic and proceed around traffic circle to your intended direction. Exit right from the traffic circle toward your intended direction. Do not stop in roundabout. Obey one-way signs. Stop in crosswalks for pedestrians and bicyclists. Note that left turns and U-turns are completed by traveling around the center island. A Westwind Air Service scenic flight is the best way to see Arizona. Air tours for bucket-listers, romantics, adventure junkies, and families. Exclusive routes, great aircraft and excellent customer service all await you. Take a Westwind flight today and create Memories that will last a lifetime! 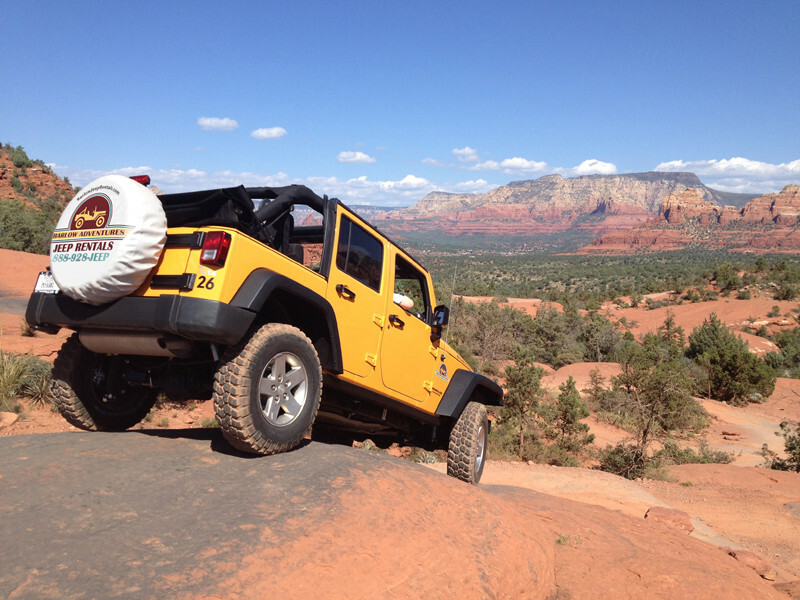 Rent a jeep and do your own self-guided tour! New Jeep Wrangler Rubicons with auto transmissions, A/C, 2″ suspension lifts, 32″ offroad tires, and enclosable soft tops. Permitted on ALL open easy, moderate, or adventurous Sedona trails. Free trail info & maps, driving tips, and ice chest with ice. We offer convenient transportation and tours for groups – from weddings and rehearsals to family reunions and custom designed tours for any needs! Two trolleys – one has A/C and wheelchair access. Group inquiries call: 928-300-1477. We customize quotes, locations, and specifics to fit any need! Arizona Shuttle provides safe, affordable travel from Phoenix Sky Harbor Airport to Sedona and the Verde Valley. We conveniently stop at most major hotels. Door to door service is available for residents. We are the preferred carrier linking Phoenix with Sedona, Cottonwood and the surrounding area. Imagine yourself in a luxury sedan surrounded by breathtaking views locally or statewide, we go where YOU want to go. We are Sedona’s hybrid car service: part taxi, part town car, part limo. Our record on safety, customer service, and reliability are reasons for our success. Click on our link now! Since 1993 Sedona Trolley has offered safe, reliable & reasonably priced transportation. 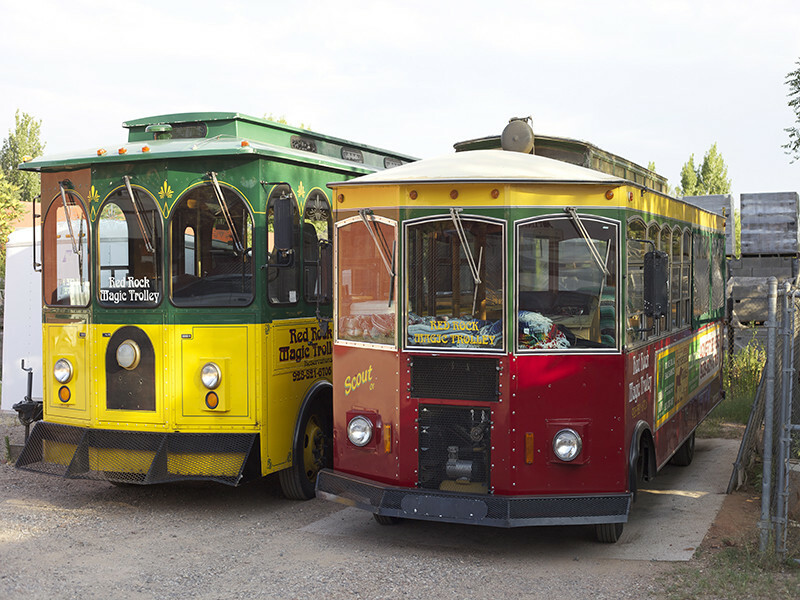 Be it a wedding or a dine-around for a corporate event you’ll find that Sedona Trolley adds the charm to any event. From wherever you are in all of No. AZ, Sedona and the VerdeValley. We pick you up and get you there relaxed and on-time. Affordable Courteous Service provided to Phoenix Sky Harbor, Mesa Gateway, Flagstaff Pulliam, Ernest A Love field at Prescott, or any other AZ Airport. Drivers safety certified. White Tie provides quality transportation for all major airports including FLG, PHX, SED, PRC & the Grand Canyon Airport for both public airlines and private aircraft. Ask about our special Phoenix Sky Harbor service, where we will pamper you with a catered lunch on your way to awe inspiring Sedona.